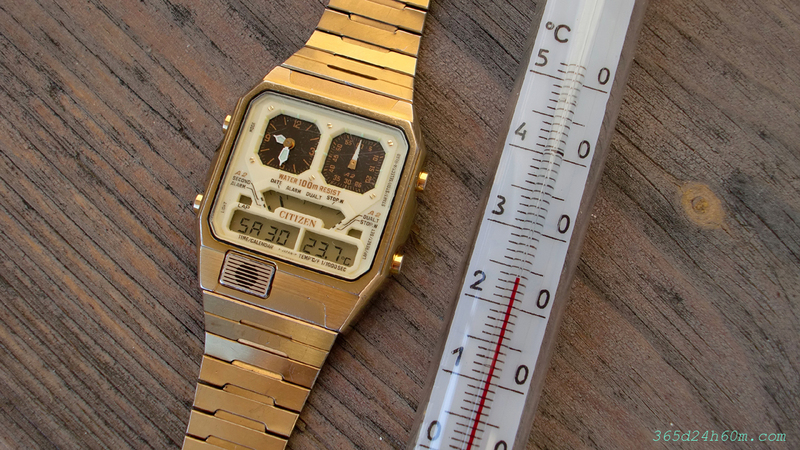 It may happen that your Citizen Watch displays the temperature incorrectly. This means that the watch may need a minor adjustment by Gold Trimmer Condenser. Before attempting to open the watch, you make sure that your watch really shows the temperature badly ! I know from my own experience that it’s easy be mistaken and believe that the watch shows a higher temperature than it actually is !!! This is related to the thermal characteristics watch (a mechanism and chassis) and the thermal inertia of the watch. In other words, the Citizen watch takes some time to ambient temperature achieved – for example, when removed from the wrist, while a higher temperature than its surroundings or when you bring the watch from a cooler place than the place in which you are making now measurement. In both cases, the watch takes about 20-30 minutes to achieve the ambient temperature. 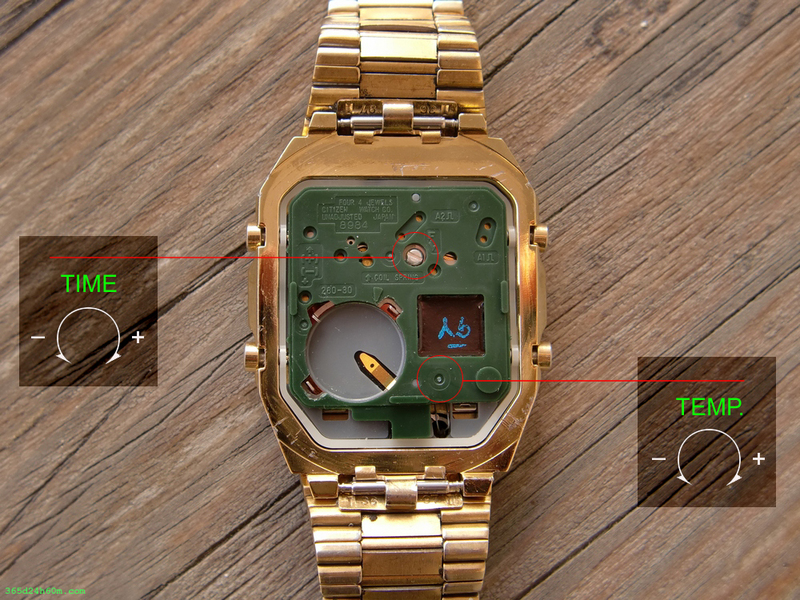 Click to enlarge…Mechanism of a watch with a visible sensor and the watch casing with a visible place on the sensor. You can also see the „aluminum cover” placed on the casing using a rubber gasket ! Although the sensor is partially isolated from the „watch case” and should immediately react to changes in temperature, however, takes some of the heat out of the housing – which is why the time is required. Click to enlarge…Temperature sensor – Thermistor. is really small – just over 1 mm in diameter. Also visible an active element – changing the resistance depending on the temperature, and two gold plated connections. The whole is immersed in a drop of glass ! Put so your watch, and another thermometer next to each other for 20-30 minutes *( this is also the time recommended by the manufacturer ). If after this time, it is still the difference indications of the two thermometers, it means that the watch requires minor adjustments, no problem ! So as you can see the watch also has the Silver Trimmer Condenser ? reserved for the time adjustment…However we leave it alone. How to adjust the temperature ? The procedure, at least in the beginning is even similar to the procedure of – Adjusting Time. 2. Now you need to gently remove the green plastic cover to reveal hidden under her The Gold Trimmer Condenser. You really be careful not to damage the tips – which are now exposed ! * Before adjustment, put back into the housing of the watch mechanism ( so as not to damage the tips ). 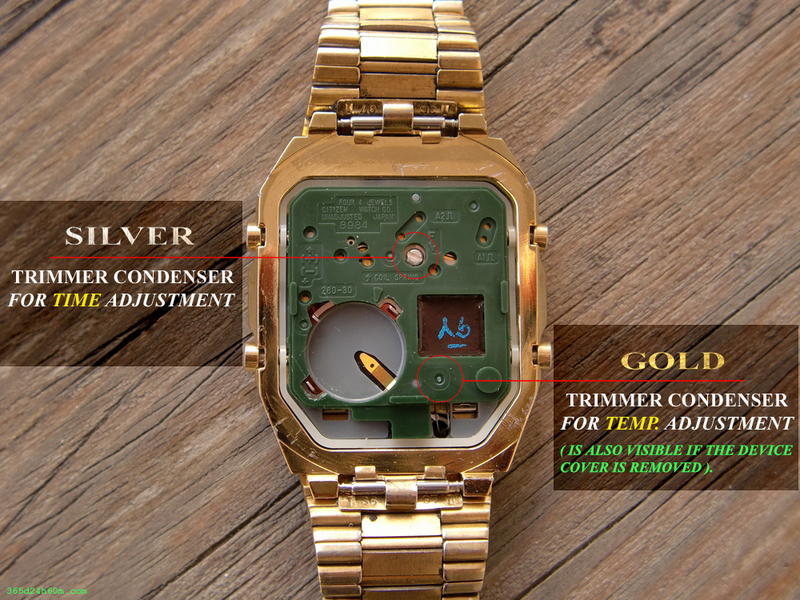 Click to enlarge…View of watch before and after removing the green cover. 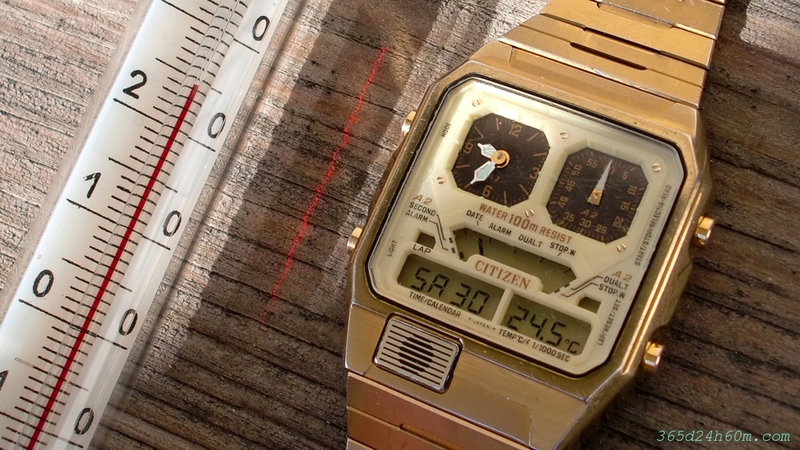 Depending on whether your Citizen Watch shows a higher or lower temperature than actually is ? you rotate in the correct direction !!! Clockwise turn ? Increase the Temperature and vice versa? *( If you are not sure ? 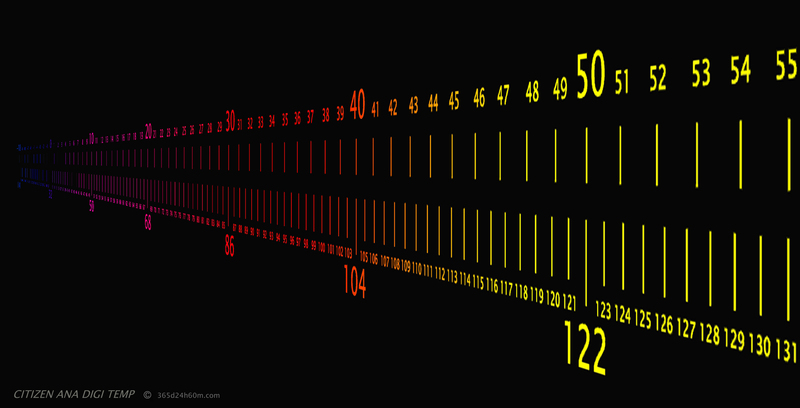 in which direction turn the trimmer or how big is the inaccuracy of your thermometer watch ? the whole procedure start from step 5 ). tape to hold the mechanism hasn?t fallen out of the case. 5. Now put your watch beside any electronic or analog Thermometer for 20 minutes (the time required to compensate for temperature watch and thermometer). 6. Compare of your Citizen’s watch and the another Thermometers indications. *All models with with Cal. No. 8980 8982 8983 8984 and Cal. No. 8985 8986 8987 8988 8989?and some of the later models may indicate the temperature in the two systems-Celsius and fahrenheit-depending on our needs. No switching is possible between the centigrade and Fahrenheit thermometers witch Cal. No. 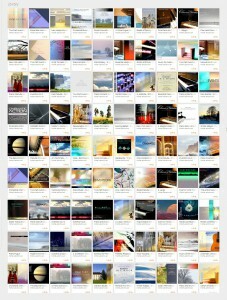 8981 ! Correct indication of the digital thermometer. As you can see picture below – an indication of the Celsius scale is about five times more accurate. For this reason, I suggest adjustments The Citizen Watch Thermometer on a Celsius scale, even if you use on a daily basis Fahrenheit scale ! The Citizen?s Thermometer with an accuracy of 0.1 degrees Celsius is about five times more accurate than indication of the accuracy of one degree Fahrenheit. The reason why recommend adjusting in the Celsius scale. Click to enlarge…Comparison of Celsius and fahrenheit scale. ( 2600 x 711 px ). repeat the procedure from step 4. 8. If you are satisfied with the accuracy of your thermometer watch, you can close it.n out of the case. How to change ? the measurement being taken at One-Second or One-Minute you,ll find in Chapter : DATE – Calendar & Temperature – on How to use Digital Modes . 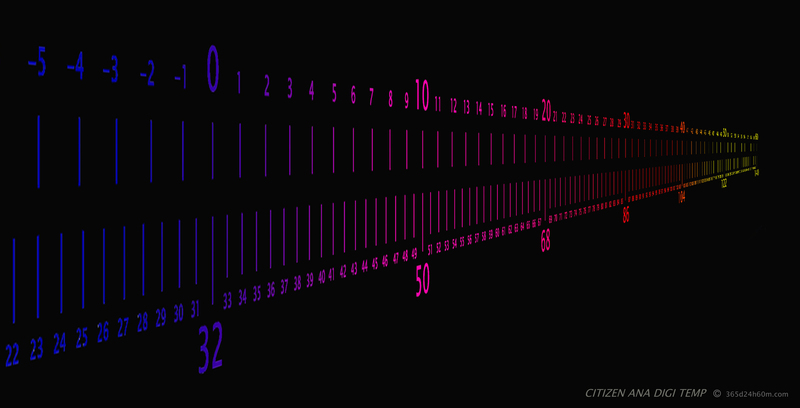 What is – Storage Of The Tempheratures Function and How use it you’ll find in Chapter : ALARM ? Alarm & Storage Temp – on How to use Digital Modes . 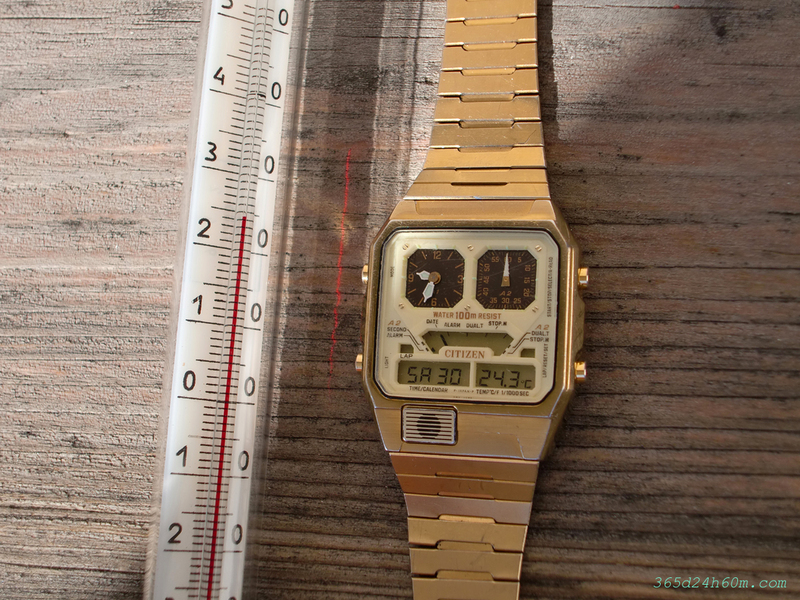 If you still have doubts – Now your question you can leave on the Vintage LCD Watch Forum.